So how many cheerleaders came to your sailing club today? Or, to ask the same question differently, can you spell opportunity? Wherever you live, however you sail, there are opportunities to spark something special. If there’s already excitement on the street, why not tap into that? I offer, by way of example, the BIG SAIL. Where I live, our “Big Game” is Cal-Stanford. We’re talking football. And most years, folks elsewhere couldn’t care less about our big game. 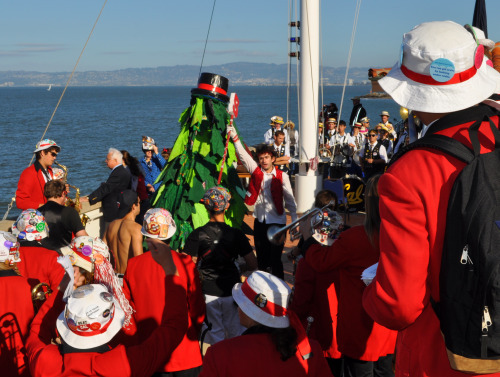 With Stanford in the running for a Rose Bowl berth, maybe the 2009 edition will attract more notice than other years, but I’m not really stuck on football here, I’m wanting to tell you about the Big Sail, the biggest thing to hit San Francisco Bay this week, simply by way of tapping into the electricity in the air. Isn’t there something in your neck of the woods that might work the same trick for you? 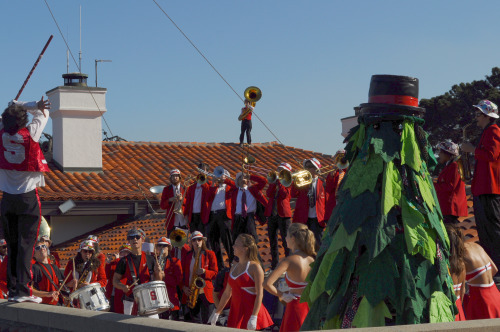 For those who need help with the photo above, that strange green thing is the Stanford Tree. And something tells me our underwriters wouldn’t like the look of that tuba player just now. But hey, it’s the Stanford Band. Varsity sailors, junior alumni and senior alumni all match raced for the glory of their schools. 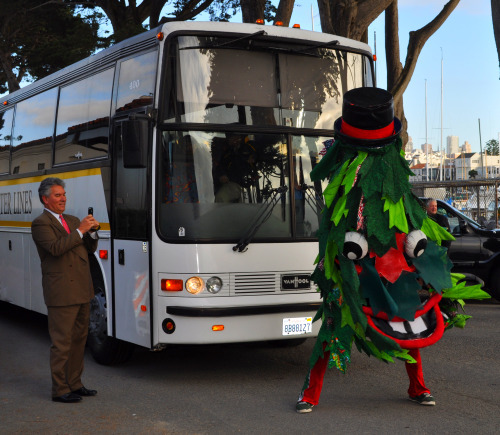 Bands played—yes, the legendary, raucus Stanford Band along with Cal—and they rocked the San Francisco cityfront. 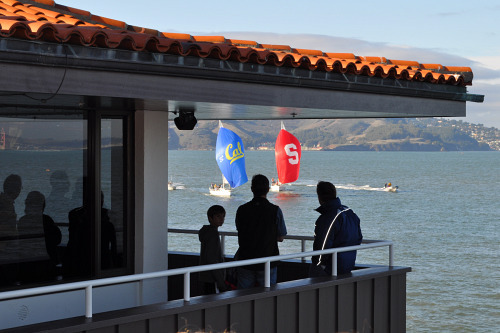 “Fun” is even easier to spell than “opportunity,” and the bands faced off on the race deck of St. Francis Yacht Club in a frenzy of noise and spirit that you just couldn’t beat. Filled the clubhouse, attracted TV, that sort of thing. 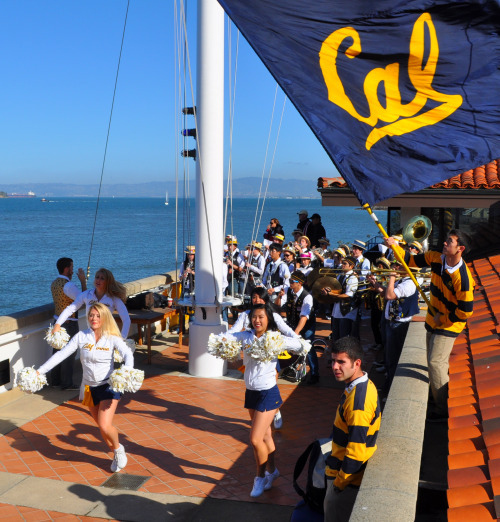 The Cal band was first to leave (last to arrive too, sort of a Cal tradition apparently) and I was briefly bewildered when the Stanford band made a sudden, hasty exit from the race deck. Then I found them, ah, entertaining in the parking lot? Nope, more like blocking the exit of the bus carrying the Cal band. Oh, the sailing. Cal had a strong day, winning in the junior and senior alumni divisions and threatening to take the varsity division too. But Stanford made a comeback to break the 1-1 tie, got far enough ahead to sail a penalty turn and stay in front, and wrapped the varsity division 2-1. That split the day, so everyone went home with something. Great lemonade, no lemons. See you on the fifty yard line.